Brett a'Court has been a full time painter since 1995. His very successful first one person show was held in 2002 at Letham Gallery in Auckland. His work of that period was enthusiastically collected and is now rarely available. In 2004 a'Court's work transitioned significantly to a more serious exploration of the world beyond the veil of perceived everyday reality. 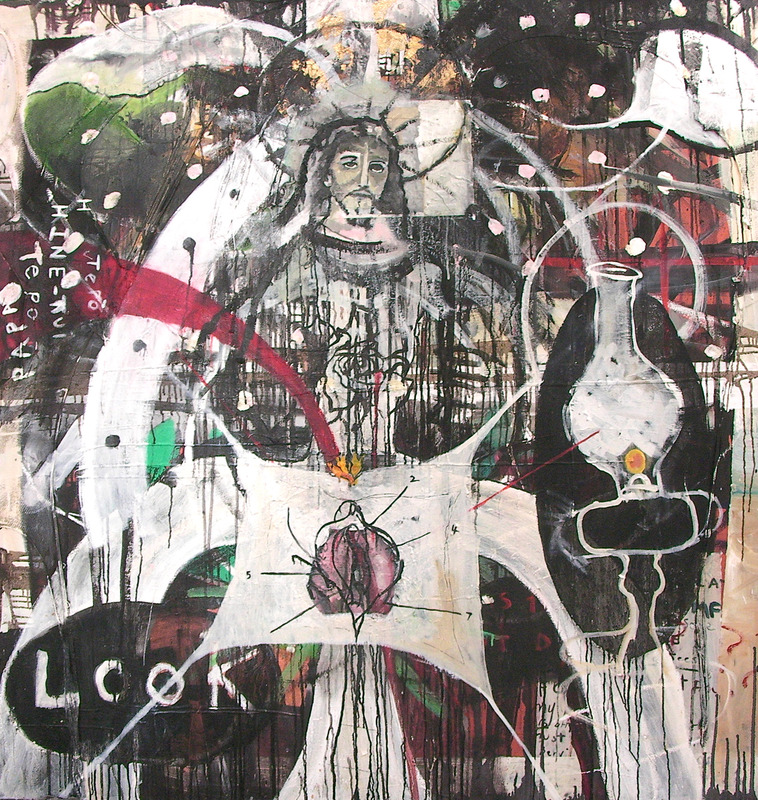 Intensely New Zealand in his darkness of palette, a'Court started to look at both high and low art religious imagery, deconstructing them into a personal vision and opened with a show in a Parnell chapel in 2006. From 2007-2012 a'Court has shown through various galleries, group shows and has had two major solo shows at the Wallace Gallery and Satellitte Gallery in Auckland. He has work in both private and public collections. Art critics have continually regarded him as a serious New Zealand expressionist and put him in the prophetic heritage of Fominson and McCahon. ‘The paintings of a'Court have a sombre palette hearkening back to Masaccio or to our own dark McCahon, who a'Court acknowledges freely. They seem to epitomise a quote from Picasso that good work should bristle with razor blades. Magnificence is diluted when transmitted or forced. Brett a'Court's paintings touch on magnificence and it is inherent and there to see’ (Wilkie). The development of my work over the years grows with my own self-knowledge and worldview and changes with experiences that open my eyes to different aspects of life and spirituality and different approaches to art practise. Every work of course starts with an idea. If the idea is not strong enough the work will not evolve or resolve itself until the idea is rethought or discarded. I believe great art is a marriage of the intellect and the intuition. I have been interested in using existing religious motifs mainly from western history and bringing them into a contemporary context. Our western culture which is saturated with sexual imagery and energy is an important part of my work. I do not want to condemn this culture, but see the Divine involved in the questions of sexuality and not divorced from them. Many religious paintings in the past have a latent sexuality pointing to the involvement of God's divine message hidden in the sexual act. The purpose of my work is in part to make a connection with man's eternal spark. I believe we have a hunger for Heaven, but not necessarily the heaven illustrated in a Baptist Evangelical tract, children's illustrated Bible or the paradise in a Jehovah Witness magazine. The dullness of clothed people wandering in parks. We ache for love, joy , peace but also excitement,stillness and Awe. We long for the dazzling darkness of the Godhead, the abyss which is overwhelming in its magnitude. I believe this magnetic force is open and real, it's ever present and my hope and faith is that my work somehow in a small way points to or absorbs a fraction of this reality. My life is devoted to trying to connect to this presence and discern the voice of God. My paintings are in many ways my journey into an unknown space, the outpouring of my prayers. In my current work I have been looking at religious images that have been apart of my environment in my childhood and also images in my immediate environment now, i.e. the framed Hindu deity picture at the local shop, the Jehovah witness magazine in my mail box, Catholic images of the sacred heart etc. I am exploring their direct and indirect meaning and influence on me. Are my experiences with them universal? Most would come under the banner of low art. The sentimentality in some of the images could be viewed as repulsive but at the same time quite compelling.